Sire: Bluegrass Bollinger, Grandsire Benleigh Ringleader, Granddam Purrumbete Vanilla. 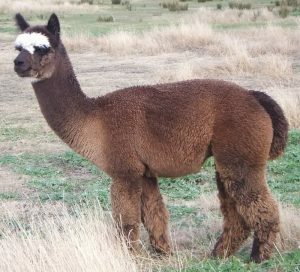 Dam: Bluegrass Camille, Grandsire Shanbrooke High Society, Granddam Alpacos Park Ariel. Metallica’s pedigree speaks for itself with both his sire and dam producing show ring quality offspring. Metallica has had an excellent show record and was shown regularly at all levels of shows. He supports a dense, highly crimped style of fleece that is even across his body. He is a very even roan with white fibres dispersed throughout his entire fleece. His histogram results backup his fineness and lack of medulated fibre. He has proved himself to be a high impact male over our females who has consistently added fleece length and weight onto his progeny, with many making it into our show team. This year we will be adding a selective few females to the For Sale list and they will be worth looking out for.